One of the easiest places and most satisfying ( and my most favourite!) to declutter is the linen closet. Take out all your towels. How many do you have? Be honest. How many do you really need? I believe 2 bath towels per person is enough. A special set for guests is ok too. A beach towel or two for each person is sufficient. 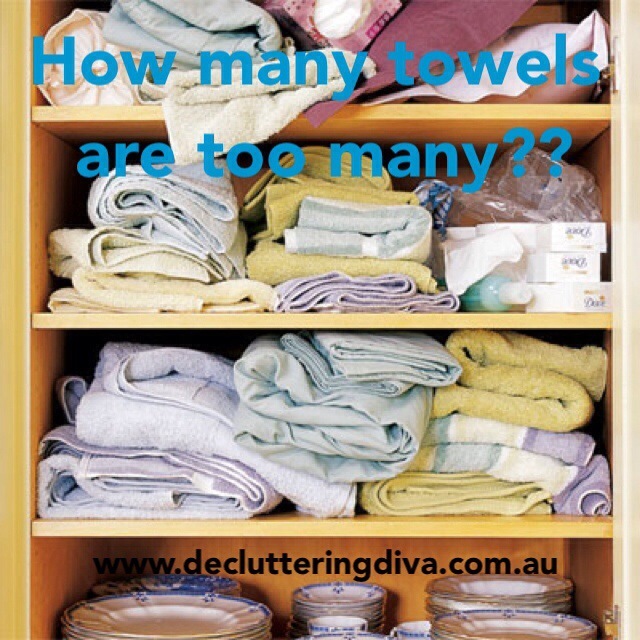 I understand the need for a couple of towels for mopping up spills etc – let’s store those in the laundry. So what do we do with all those extras? Donate them to an animal charity or the like. And remember when you buy a new set, the same number need to leave the linen closet. One in, one out.